Using PST extractor tool you can export complete PST file data items including emails, contacts, tasks etc. in four different file formats and that too without having MS Outlook installed on your system. Outlook PST extractor allows you convert Outlook PST to PDF with attachments that can be viewed as evidence for forensic analysis. 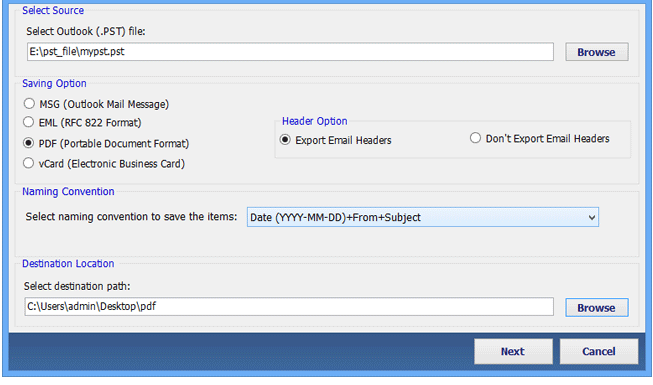 Here you can also select the advance option that will export emails with a header or without header. Export Outlook PST file into various targeted file format with a wide range of different naming convention. This naming convention allows you to save targeted file format according to a different naming convention like subject, subject + date etc. Extraction of PST file into other formats will preserve Meta data (Cc, Bcc, from, to, subject, receive and send date) and attachment as it is to different file formats i.e. without any modifications. 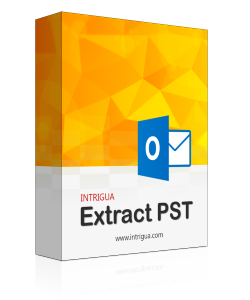 PST email extractor enable you to extract data from orphaned PST file (unused PST) as the software doesn't require MS Outlook to be installed for extracting PST file. Also, the software has the capability to extract any size PST file. You need not worry about the original multilevel structure of folders or subfolders of PST file into targeted file format. As this tool will ensure to maintain an original hierarchy of PST file after extraction. MS Outlook stores its data in Personal Storage Table (.pst files) when a user configures Outlook with POP3 or IMAP based email client. PST files consist of user data like emails, contacts, calendar and other information. These files are created on the user’s system and hence are free from mailbox size issues experienced on mail server. PST files are mostly used for archiving user items that too from different email account types. Archived PST files are helpful in case of data loss on mail server. As mentioned earlier, Personal Storage Table is created and stored on the user machines. But you cannot directly access or open them navigating through any directory. To Locate the PST file you first need to open Outlook Application>> then right click on respective email account>> finally click on Open File Location. Note: This method is applicable to all windows and MS Outlook versions, to find the location of PST files. The following reasons will explain various situations and reasons for converting PST File. When a user wants to share PST files either from one organization to other or among a group of users, then Outlook PST conversion is needed. The recipient needs the other file format to receive PST file. PST file migration is also necessary when you need to access a file in other email clients. As there are many other popular applications like Microsoft Outlook Express, Lotus Notes, Windows mail support etc which have different file format. Maintaining a backup of your data files is a good practice of work. And to have a proper backup of your data, generating PST file are the best way. And the backup will be more helpful if you could convert PST file. 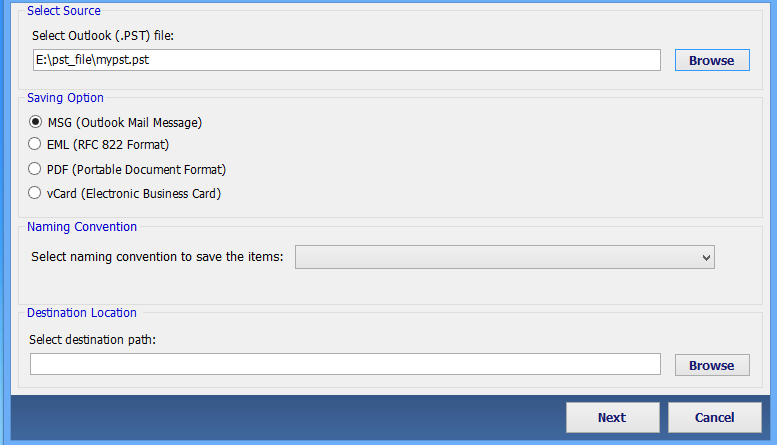 Step 1: Launch the Software and select the desired PST file. Step 2: Specify the targeted saving file and naming convention option. 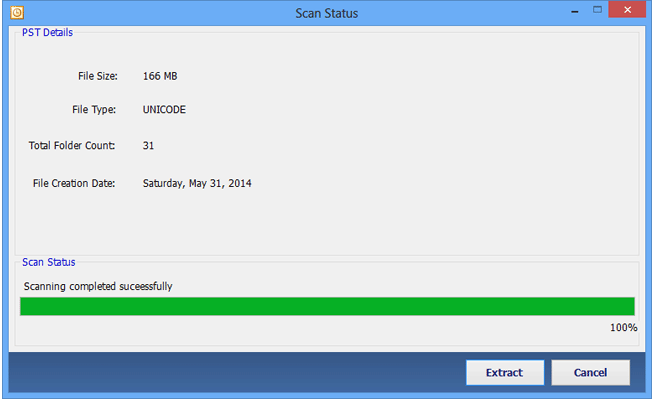 Step 3: Scanning process will begins, Click Extract to begin extraction of PST. 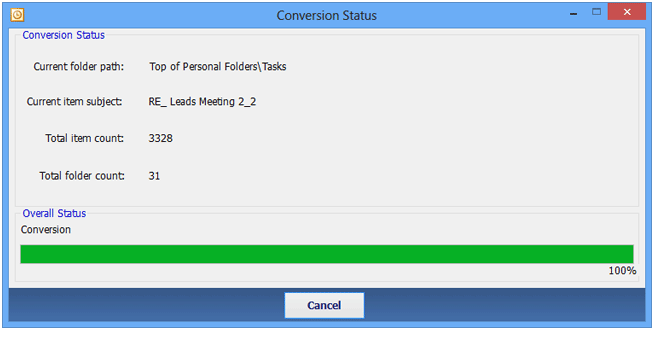 Step 4: View conversion status of PST file then click ok after completion. Have a glimpse of PST extractor software vedio to extract the PST file in differenrt file formats. This vedio developed for our users to clench the basic idea of software working. Does this Software require MS Outlook installed on system for extracting PST files? NO. Extract PST tool doesn't require MS Outlook installed on system for extracting PST into other file formats. Can we extract PST file using this software on latest version of windows? Does this software support ANSI and UNICODE format? Yes. This software supports both ANSI and UNICODE format. Is this software Extract PST into PDF file with all attachments? I want to transfer all email from Outlook to Outlook Express. How can I achieve this? You can easily do this by extracting PST file into EML format. This software makes you interoperable by extracting PST into different file formats that is supported by various mail client. How much time does this software takes for extracting PST files? I had an orphaned PST file and I wanted to know about its data item but I don't have MS outlook installed on the system. Then my colleague introduced me with Intrigua Extract PST software that helped me a lot in accessing the PST file mail by converting it to PDF format. Few months ago I need to switch my mail client from MS outlook to outlook express and I wanted to transfer all data from outlook PST to EML format. I found many third party tool, but only Intrigua Extract PST software works for me and realized that it's a complete package at affordable price.